A British artist, Ed Sheeran hints at working with BTS. On November 20th, a British media, Heat & Heatworld disclosed a video of Ed Sheeran on its official Twitter. In the video, Ed Sheeran received a message from one of his fans saying, "I want BTS x Ed Sheeran but when will they ever". And Ed Sheeran excited fans with the response, "I actually wrote a song that I think they might be messing with," "I like BTS" he added. 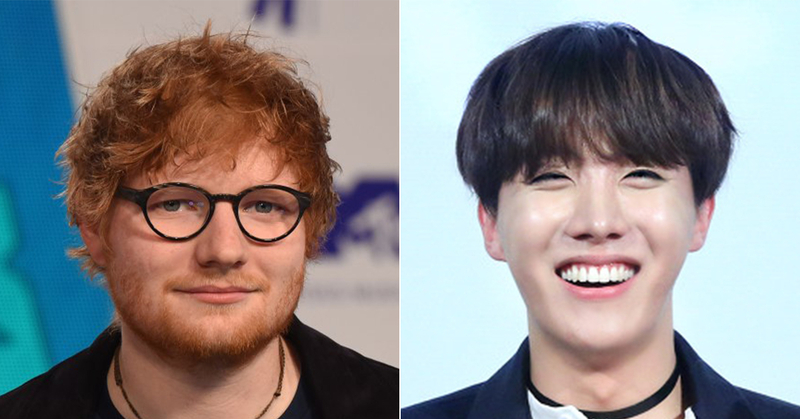 This wasn't the first time that Ed Sheeran showed interest in BTS' music. On August 24th, when BTS released an album called LOVE YOURSELF 結 ‘Answer, Ed Sheeran said on his Instagram, "Congrats to BTS who are about to have an incredible week. Cool album." A while later, BTS also mentioned Ed Sheeran. J-Hope, at the press conference for BTS global tour, LOVE YOURSELF, said, "We were very surprised when Ed Sheeran mentioned our album," "We got dumbfounded since we had never met him or worked with him before," he added. As Ed Sheeran hinted at making music with BTS, many international fans are having high hopes on it. Will this amazing collaboration between the global artists ever be realized?